Ever since my daughter started taking riding lessons a year ago, I've been wanting to make her a pony saddle pad. I clarify "pony" because she is so little (maybe 45 lbs soaking wet) that she rides ponies only so far. But lots of the girls at the barn bring their own saddle pads with them, and I thought "I can MAKE that". Of course, I've been hoarding Heather Ross' West Hill fabric for just such an occasion. I will admit, I did use a pattern. The pattern overall, I was NOT happy with, so I will be making my own pattern for the next version. The shape is too boxy and the directions were awful. And once my daughter sees this, I'm sure I'll be making MANY more. For the back I used Sis Boom (Jennifer Paganelli) Poodle. It's a simple shape, with simple quilting. The most challenging part is using webbed binding. It's a tiny bit slippery, and I was using vintage stuff I had on hand. You really need to use webbed because of the crazy wear and tear it takes. Overall, though, really, it looks fantastic I think. 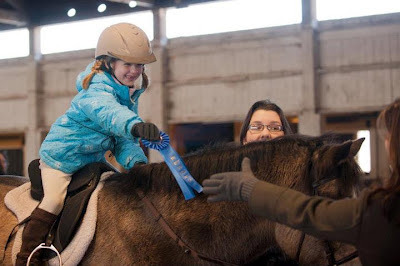 Here she is last winter winning her first ever blue ribbon. Now wouldn't this picture be cuter with her Heather Ross Saddle Pad?